Executives from the Arizona Cardinals, Arizona Diamondbacks, Phoenix Suns and the Arizona Coyotes shared insight into their paths to leadership. It’s not easy for anyone to be successful in the professional sports business, but these women executives have each blazed a path to success working for Arizona’s top sports franchises. From helping terminally ill children to enabling a young man in her community achieve his dream of attending college, Debbie Castaldo, vice president of corporate and community impact for the Arizona Diamondbacks, is passionate about helping her community. Throughout her career in the Diamondbacks front office, she’s seen that the most effective leaders are fearless. “Be as bold as possible,” Castaldo said. During February’s Professional Women’s Alliance luncheon, executives from the Arizona Cardinals, Arizona Diamondbacks, Phoenix Suns and the Arizona Coyotes shared insight into their individual development as leaders. Being denied a raise by an employer is never easy, but if your gender is the reason for the denial, that can be detrimental to a young professional. That’s exactly what happened to Julie Fie, vice president of basketball communications for the Phoenix Suns, early on in her career. Fortunately for Fie, she was able to take the rejection and turn it into motivation to push harder to get what she wants and deserves. “Be your own champion,” Fie said. It’s no secret that hard work is essential to success, but working hard for the success of others is a vital piece of a leadership. Successful leaders identify strengths, promote development and celebrate achievement in their team members. “Empower people to accomplish their goals and work for a better team,” said Theresa Miller, director of financial planning and analysis for the Arizona Cardinals. Encouraging teams to find answers by removing roadblocks between problems and solutions is just part of what leadership should aim to accomplish, Miller added. Olivia Campos, director of community relations for the Arizona Coyotes, established effective communication in her organization with an open door policy to help colleagues. In fact, Campos, who also serves as executive director of the Arizona Coyotes Foundation, policy works so well that Coyotes staffers presented her with an official guest sign-in book for her numerous office visitors. -Written by Alexie Chavez, marketing communications coordinator for the Greater Phoenix Chamber of Commerce. 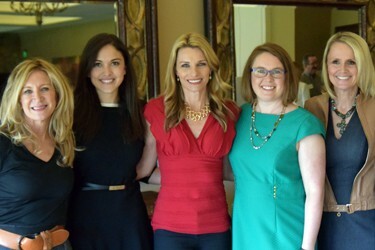 To see pictures from February’s Professional Women’s Alliance: Women in Pro Sports panel click here. The next Professional Women’s Alliance luncheon will be on Tuesday, March 14 featuring Christina Noble, vice president, business development for Sonora Quest Laboratories. Noble will share insight on how transformational leadership can be the recipe for influencing change. Register today!